Following the release of his album The House, Aaron Maine’s synth-pop project Porches now shares the official video for “Goodbye,” a beautifully melancholic single off the album. Maine portrays Ricky Pepsi, a lonely pianist, setting up the church venue for an intimate show. The crowd comes in after Maine carefully places the chairs, lays out the cheesy puffs and other assorted snacks, and sets up the stage in preparation for his show. 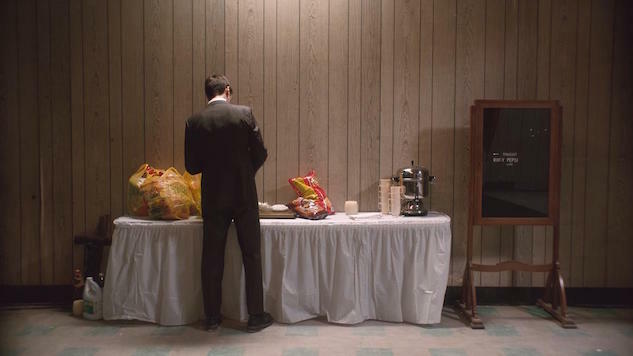 The video, masterfully co-directed by Maine and Nicholas Harwood, shows the protagonist’s struggling performance, as Maine’s Pepsi climbs over the piano, confronts the audience and flips over the assortment of snacks he so carefully laid out. In the end, the crowd commends him on an extravagant show and the musician calms his anxiety by diving into a swimming pool. “Goodbye” is the third music video coming out of The House so far, following “Find Me” and “Country,” both released last year. Maine is currently touring North America in support of his latest album. He recently had to expand his New York shows due to popular demand and has added a third show at Elsewhere in Brooklyn, N.Y., on Sunday, March 25. See Porches’ full tour slate below. Watch the new music video for “Goodbye” below and conquer your fear of public speaking once and for all. The House is available to purchase through Domino Records right here.